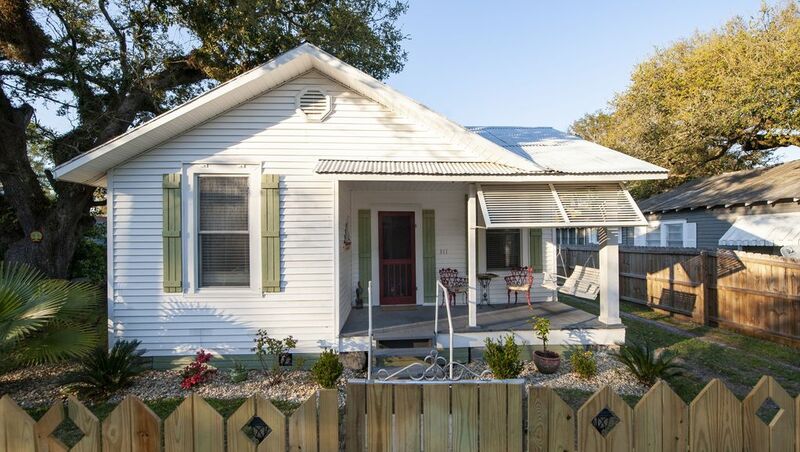 Cozy 2Bd/1Ba cottage with large fenced yard. 3 Blocks to sandy beach. Off the beaten path but close to downtown and beach. Enjoy the early morning or late after noon on the open front porch with swing, chairs and table. If you want to enjoy more privacy, then you may want to choose the back yard patio where you can grill on our gas bar-b-q while sitting around the patio table enjoys a nice cold beer or cocktail. In case it rains and you still want that outdoor feeling, then there is a covered area with table and chairs. If you need some exercise, and you want to venture out past the large fenced in back yard, then you may want to stroll down the tree laden street to the beach. It is only a few blocks away. If you want more and want to check out the historic district of Bay St. Louis, Main St. is about 10 blocks away. If this is more walking then you want to do, please use our bicycles. We have 4 bicycles but no helments. Please ride at your own risk. Another alternative would be to rent a golf cart or bring your own if it is street legal. This laid back 2Bd/1Ba early 20th century is equipped with queen size beds, lines, towels, washcloths.and paper products. Kitchen is equipped with cooking utensils and cookware. Dishes, Silverware, and glasses for four. Bedrooms with . TV in Living room and also in Den areas. Internet provided. Pet friendly subject to manager's approval. This property has a serene atmosphere, both inside and out for a price that won't break the bank. Cute place not far from food and drinks. We rented the cottage for Cruisin the Coast. The place was very clean. Close proximity to beach and downtown area. If we plan on coming to the area again, we will definitely consider staying once again. We loved the cottage! The grass was a little high in the back so the kids didn’t want to play. The backroom where the table is there was no air vents so got really hot during day. Besides that we loved how close to down town and the beach it was. We probably would book again but not during the summer. Yes, our lawn maintenance people were a little behind schedule due to previous days with rain. Additional efforts will be made to maintain the yard. We are aware that sometimes during extremely hot days the backroom is a little warmer then the rest of the house. Plans are in place to remedy this situation. We appreciate these comments as we continue to make our properties the most pleasurable experience we can make it for out customers. The location is ideal for visiting the beach. It is about 3 blocks from the shore. Downtown Bay St Louis was adorable! The fenced in yard was perfect for our dog. Joey was an absolute delight to work with in planning our vacation. Non-refundable Accidental Property Damage protects you for up to $2000.00 in ACCIDENTAL Damage. Tenant accepts responsibility for damages in excess of $2000.00.